Al Spears of Bolingbrook and Timothy “Twist” Fergusen, of Lockport, listen to other blues musicians as they wait for their turn to play at Carter’s Place in Lockport. Every Wednesday night the bar has a jam night for local musicians to sit in with the band. If scenes from Joliet’s history played out on a movie screen accompanied by a soundtrack, it would be laced with songs from Robert Johnson, Muddy Waters, Elmore James and Howlin’ Wolf. That’s because the Joliet area has a history entrenched in the blues, as deep as the limestone in the rock quarries, as gritty as the steel on the East Side train tracks. The blues are alive and well in Joliet, stronger than ever, thanks to some hard working bands and fervent fans of the music. 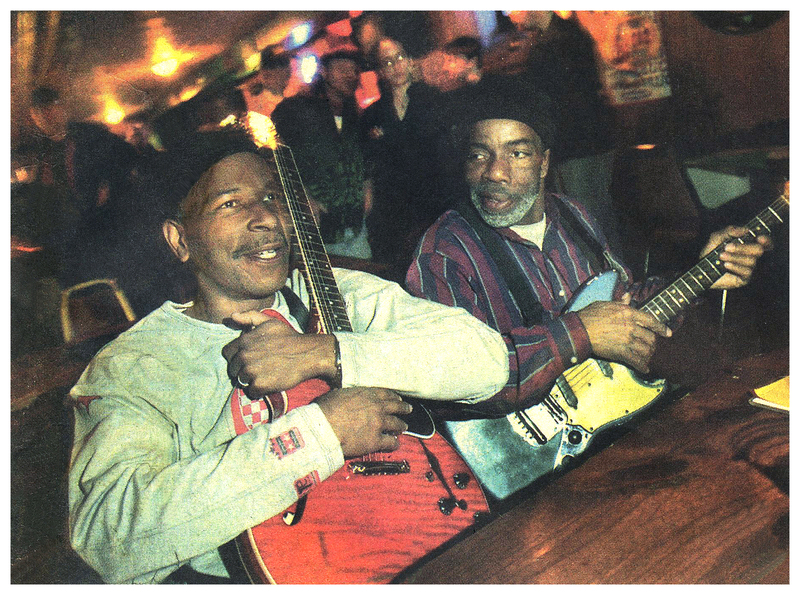 With Buddy Guy coming to town on March 7, It’s appropriate to stop and take stock of the local blues scene, which is thriving thanks to blues jams at bars throughout the area; a new blues bar and others booking blues acts; local mainstays and new blues bands keeping the music alive in Joliet; and a weekly radio show devoted to the blues that broadcasts from the Rialto Square Theater. Armando “Mondo” Cortez, lead guitarist of the Chicago Blues Angels, is from Joliet and is well known in musicians’ circles. He plays locally at places like “Doen From the Tracks”, “Blues Etc”, “Just One More”, “The Uptown Tap” and “Carters Place” in Lockport. The band has one CD out called “Movin Out,” which was released in 2000. They’ve been touring the world since to support it, and are currently working on a new one. Susan Williams from Tinley Park, sings as she and drummer Greg Campbell, from Joliet, play in the house blues band at Carter’s Place in Lockport . Williams, Campbell and guitarist Pauline York organize a blues jam at the bar every Wednesday night. Keith “Junior Blues” Zofkie is one such person. The twenty-six year old Lockport resident said he got a lot of his experience playing blues jams alongside blues veterans like Timothy “Twist” Ferguson and Al “Hurricane” Spears. He started playing blues guitar in high school, when he discovered the genre from listening to blues based bands like AC/DC and Led Zeppelin. “It’s the only kind of music that gets you down deep in the soul,” he said. “I love the blues, and there’s so many good players out here. I have learned so much so fast just from playing with some of these guys out here… you don’t get that in Chicago. I have played in Chicago and its not the same.” Zofkie is recording his first album at the end of the month. Pauline York of Crestwood is another popular area blues artist. She fronts the Pauline York Blues Band and hosts a jam night at Carter’s Place on Wednesdays. She’s got one album out right now called “Blackberry Wine,” available for sale on her web site. Blues musician Pauline York, from Crestwood, sings with the house band at Carter’s Place in Lockport. York, a lead guitar player, helps run a blues jam night where local musicians take turns playing with the band every Wednesday night at Carter’s Place.